Billionaires Row - Most Luxurious Mid-Town property. Largest (2300 sq.ft. ), Classic 6 pre-war in all Manhattan. Newly renovated kitchen & bathrooms. Decorated in the finest taste combining European antiques with mid century modern furniture. Immaculately maintained & appointed. Lovely art collection creates cozy & inviting atmosphere with over-sized rooms, working fireplace and air conditioning in every room. 18th Floor Condominium with magnificent river & skyline views from all 13 windows and exquisite sunsets. Elevator, 24 hour doorman providing necessary services. 5 minute walk to Lincoln Center, Canegie Hall, Theaters, Central Park, Columbus Circle. Each of our 3 bedrooms have their own en suite bath , Master bath has Todo electric toilet / bidet . Also, within each bedroom includes a large flat screen TV. Two bedrooms feature king beds and the third features 2 oversized twins for flexible sleeping arrangements. Ideal home to experience all the pleasures New York City has to offer. Within 5 minutes walking distance to Central Park, Lincoln Center, Carnegie Hall, Museums, Theaters, Time Warner Center, Whole Foods, Pharmacies, 5th Avenue Shopping & Restaurants right at your doorstep. 3 outdoor spaces include: large European fountained patio plus 2 rooftop terraces for optimal relaxation - sumptuously decorated with trees, flowers, plants, outdoor fountain. Amenities include: Beautifully landscaped courtyard with seating areas perfect for wine and outside entertaining, amenity rooms include: Dining Room, Reading Library, Game Room, Pool Tables Room, Music Room with grand piano, Party Room, Conference meeting Room. We are a professional couple who pursue cultural interests in music, art and theater. We live in Manhattan, travel frequently and enjoy sharing our gracious, serene home with visitors to NYC. We purchased this property due to its ultra convenient location in mid town, near all Manhattan activities, combined with a nature's river view and a garden setting. This was an amazing property. The owners have created such a wonderful environment and the location was excellent for what we planned to do while we visited New York this year. 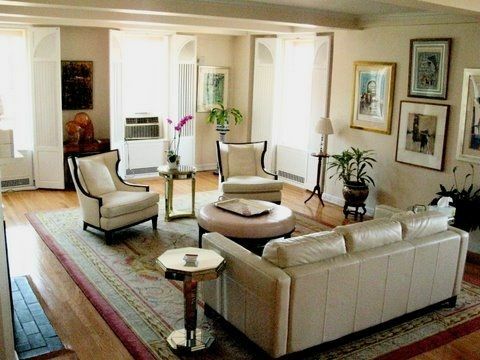 Close to Broadway, Columbus Circle, Central Park, beautiful city views (Day & Night), subway, shopping, & restaurants. We loved it. Thank you so much for sharing this wonderful santuary in New York! Six of us (three couples) stayed in this property for five nights a few weeks ago. It is difficult to convey the feel of this apartment, which is spacious, elegant, and beautifully decorated - exactly as the photographs show. The location is wonderful - one block from the Columbus Circle subway station, another two blocks or so from there into Central Park, an easy walk to Times Square, etc. Restaurants, bars, and shops are steps outside the door. The owners were a pleasure to deal with, and the apartment itself was a major part of our New York experience. As tourists, we were out and about every day, trying to see and do as much as we could in a short time period. Being able to relax and luxuriate in the mornings and evenings in that spectacular place made all the difference in our trip. We hope to have another opportunity to stay there someday. Our favorite element in the apartment is the entrance, living and dining room area with its spectacular views over the City, the beautiful sunsets and nighttime views, its comfortable armchairs and sofa. Everything else was fine, too, e.g. the beds (those used by us 4) were all very comfortable, the master bathroom was exceedingly luxurious (and with a spectacular view, too), and the air-conditioning in every room was truly helpful in August. The photos accurately reflect the apartment's appearance and amenities. The individual arrangement of furniture, paintings etc. in the apartment gave us the cozy and "everyday life"-feeling we prefer so much over staying in hotel rooms. The owners gave us a phone-number to contact them if any questions or problems should arise during our stay. As everything went smoothly all right, we needn't use it. We also appreciated it very much that we could stay till 6 p.m. on the day of our departure. Our flight back went around 10 p.m., so we could visit some sights and a great restaurant without worrying about where to put our heavy luggage. The atmosphere in the house was friendly and quiet. When we needed some quick advice, we mostly asked a kind doorman when we passed by. We can thoroughly recommend this apartment. Naturally, we would not recommend to stay in a Midtown Manhattan apartment for traffic noise sensitive sleepers (or only with earplugs). We went sightseeing on all of our 7 days in NYC. The nearest subway station is a very good point of intersection which also enabled daytime breaks for a shower, a nap or the depositing of shopping-goods in no time. A nearby plaza was a great location to just sit on the stone steps and watch the City in a stress-free manner after a long day. In our view, it's a likeable neighborhood, with an average rate of hustle and bustle (for Manhattan of course, not for the Bavarian countryside where we come from), providing everything you could need nearby. We also loved Central Park in a walking distance. If we once again travel to New York City in a party bigger than 2, we will certainly try to get into this apartment again. Beautifully landscaped(fountain and rose bushes) large courtyard with seating areas for outdoor entertaining and reading. Inquire with property owner directly regarding monthly stays.